Meal planning is one of those amazing things that is easy to do, yet providing you with a surprising amount of benefits. Learn how to save time & money by using a menu planning template, which can also help you add variety and healthier food choices to your diet. 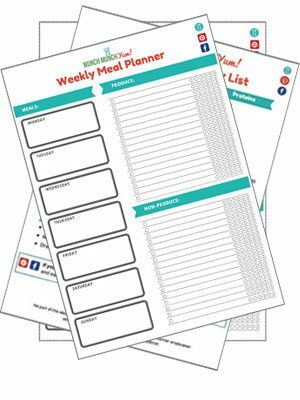 We’ve even got a free meal planner you can use! At its core, the basic idea behind meal planning is pretty simple: deciding beforehand what you’re going to eat for the rest of the week. Whenever you know ahead of time what you’re planning to eat later that week, you are already informally meal planning. For example, if you know to always keep cereal in stock because that’s what your family eats every morning, that’s technically meal planning. 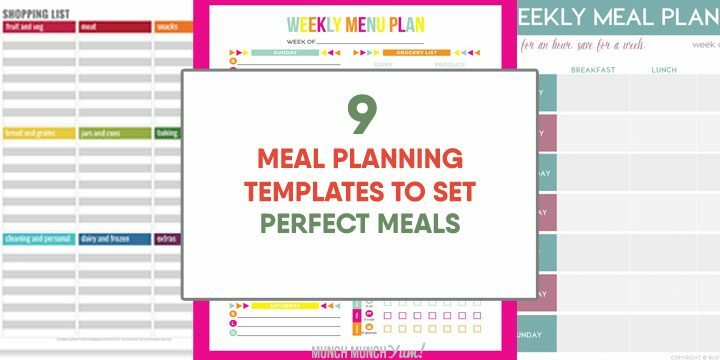 However, to maximize all the potential benefits of meal planning, the best way to meal plan is to do it formally, by writing out your plan in a calendar or meal planner template like the one we have for you here (it’s free!). 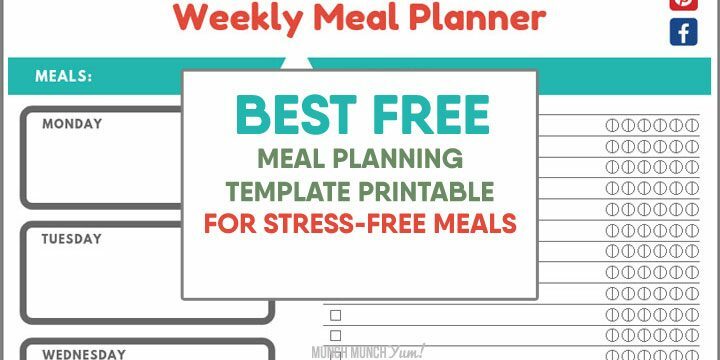 Want this FREE Meal Planning Printable? Join our mailing list and get it sent right to your inbox now! 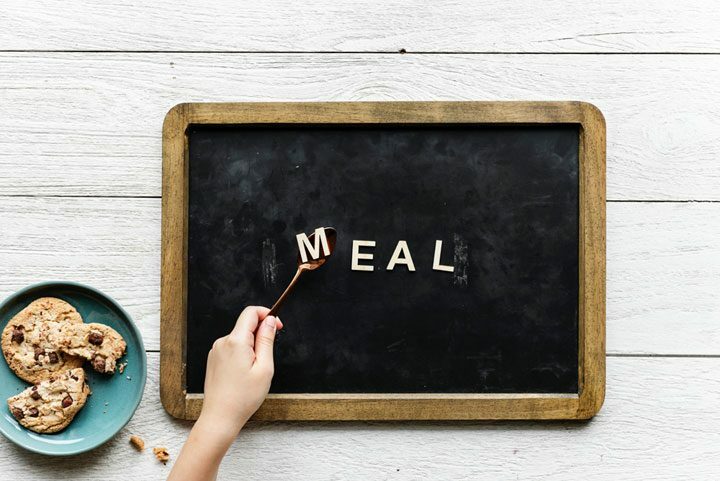 It’s pretty easy to find premade meal plans online, that have pre-chosen meal recipes and corresponding grocery lists already organized into a convenient, printable form. 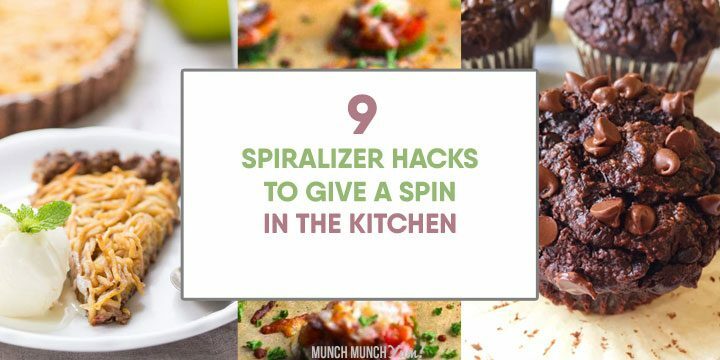 If you happen to not like any of the meals, though, it might not be easy to remove the ingredients from the shopping list that pertain to the meal you don’t want, and then add in the items for the meal you’d rather replace it with. 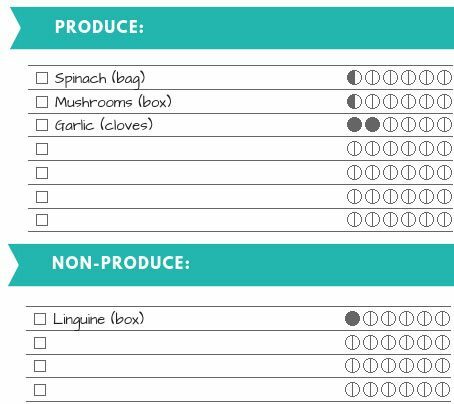 Fortunately, meal planning can be totally customizable and is super simple to do on your own. Our free template is blank, so you can choose only the meals you want and use it anyway you see fit. Although there is such a thing as a monthly meal plan, most people think ahead only about a week at a time when it comes to their meals, so our template is designed for weekly use. The alternative to meal planning is to just decide what you’ll eat as each day comes along. Before you dismiss meal planning though, let us show you all the ways it will make your life so much better. The number one way to save money on anything is by setting a budget and sticking to it. This is difficult to do with groceries, though, if you have to stop and redo the math every day as you decide your dinner plans. With a meal plan, you can see how much your entire week or month will cost you and make adjustments now, rather trying to figure out if you’ve gone over and come up with a cheaper dinner idea while you are standing in the aisle of the grocery store after you’ve already had a long, exhausting day. When you meal plan, you can layout all your coupons and ensure you hit them all before their expiration dates come up. Plus, you can scan multiple grocery store ads and efficiently plan what to get where. You can also take the time to come up with dinner ideas that incorporate as many sale items as possible. 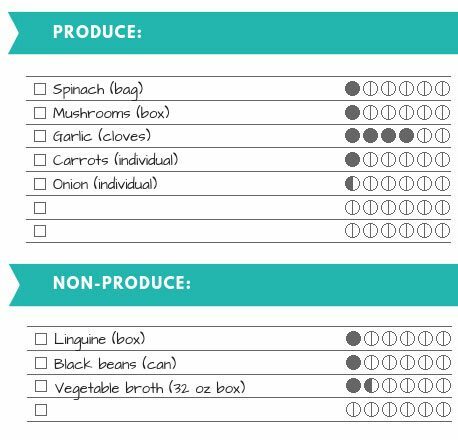 When you meal plan ahead, you are pre-identifying everything you need so you can shop for the necessary items all at once. This eliminates having to make extra, unexpected trips to the grocery store because you realized that you were missing an ingredient for the dinner you had just decided you want to make tonight. Again, having to making decisions after a long day at work is not ideal, but there’s no reason you have to if you meal plan. Trying to figure out what ingredients you have on hand and what you can make for dinner isn’t always as easy as it sounds, but meal planning completely eliminates this burden. If you want to incorporate more fruits, vegetables, grains, and legumes into your diet, meal planning is a excellent way to do that. You can start off deciding what specific vegetable or healthy ingredient you want to feature each night, then choose a recipe that showcases it. This ensures you get the healthy mix you want. One of the most common complaints people have about home meals is that they feel like they are stuck eating the same things over and over. Meal planning gives you the opportunity to ensure that you can coming up with a wide variety of dishes for your family. Since most people do their meal planning on weekends or when they have some downtime, they have the leisure to explore online and look for new recipes they want to try. Believe it or not, Americans waste on average a pound of food per person per day. This is bad for both the environment and your pocketbook. By meal planning, you can make sure that you have a use for the entire produce, box, or can of everything you buy. 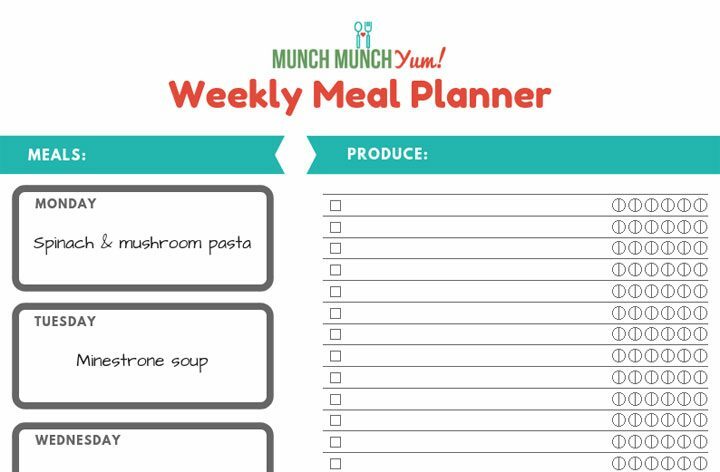 To illustrate how meal planning works, let’s walk you through the steps using our free printable meal planning template as a guide. Step 1. Fill out what you want to eat for each day of the week. Step 2. Start with the first dish and write down all the ingredients you’ll need to buy on the right half of the meal planner template to begin creating a grocery shopping list. To make things easier for yourself at the grocery store, separate out the produce versus non-product items. If you are using our template, you can color in the circles to indicate the quantity you need. Step 3. Continue in this manner with the subsequent recipes, adding more items as needed to complete your grocery list. If a latter recipe includes an ingredient that you already have on your shopping list, just fill in additional bubbles instead of writing the ingredient on the list a second time. Add more recipes and ingredients needed from the store. That’s really all there is to it. The nice thing is, you can also save any meal plans you create and recycle them in a few months again if you’d like. Meal planning really is a great way to make life a little easier on yourself. Some people actually enjoy the process of planning dinner for the family and looking for new recipes to try. Again, it is much easier to do this when you have some time to sit down and devote yourself rather than scrambling to come up with ideas on your already busy weekdays. 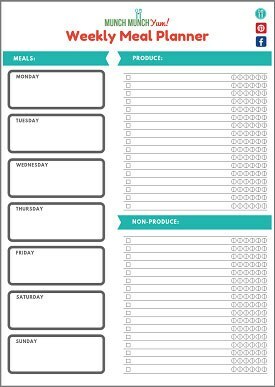 Use our free meal planner template to create your own custom meal plan today! 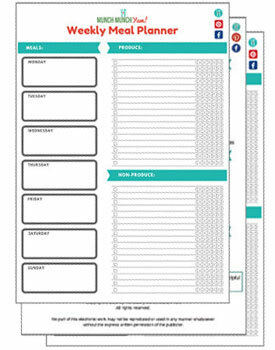 If you loved this post or our free meal planner template, please share with your family & friends!